Based in Caledonia - 10 miles south of Grand Rapids. Slush machine rentals (also known as margarita machines) are all we do, and we do it better than anyone in the business. Parties, corporate events, or special occasions - we stock many flavors from traditional bar mixes to the healthy 100% juices that school districts are now required to serve. Having a party, office function, or corporate event? Heat up your party & cool off your guests! No ice, no mess, no noise, and most of all, no headaches! (Except for possibily a totally worth it sphenopalatine ganglioneuraigia) Give us a call today. Additional mixes $20 (plus tax) per bottle (makes 48 - 8 oz drinks) Recommend 1 bottle per 20 guests – can return if unopened. Extra bottles of concentrate will automatically be left and picked up if not used – we don’t want you to run out! We set up machine and mix initial product. We pickup and clean machine. Provide power via 110V electric outlet – this machine pulls 14 amps so it needs to be on it's own circuit. Have a place ready to sit the machine that can support 150 pounds. The machine is 20” Wide, 20” long, 33” tall. Please allow 2 weeks lead time if possible Reservation requires $50 refundable deposit. 10 mile radius of 49316 as measured by Mapquest. Additional miles charged at $2.00 per mile. Cancellation fee of $50 may be charged if rental canceled less than 5 days from event. There are several reasons! First, we control the product that goes into the machine. Our name is on the product and we have formulated it to be the best tasting slush available. Second, we are equipment experts with over 10 years of experience fixing every aspect of these machines. We are able to make sure they are reliable and freeze fast. Lastly, we are not in a rush. Believe it or not we are actually slower in the summer than at any other time of the year. This gives us a schedule that is flexible enough to be able to drop off and pick up your machine as your event dictates. 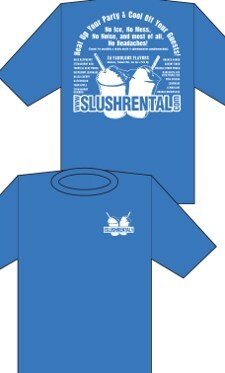 Book now and get a free Slushrental T-shirt!